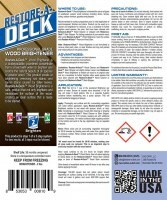 This product is step 2 of the Restore A Deck system. 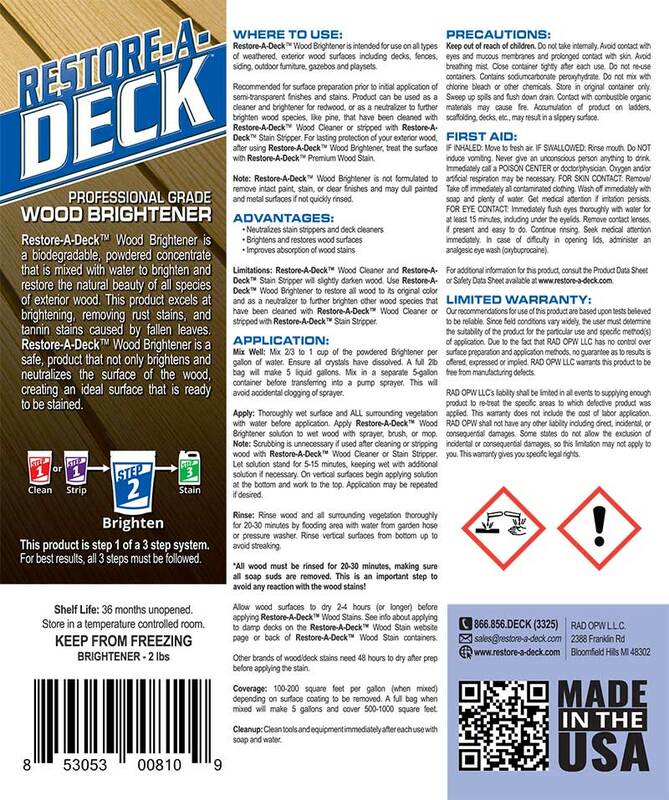 Restore-A-Deck Wood Brightener is intended for use on all types of weathered, exterior wood surfaces including decks, fences, siding, outdoor furniture, gazebos, and playsets. Recommended for surface preparation prior to initial application of semi-transparent finishes and stains. The product can be used as a cleaner and brightener for redwood, or as a neutralizer to further brighten wood species, like pine, that have been cleaned with Restore-A-Deck Wood Cleaner or stripped with Restore-A-Deck Stain Stripper. For lasting protection of your exterior wood, after using Restore-A-Deck Wood Brightener, treat the surface with Restore-A-Deck Premium Wood Stain. 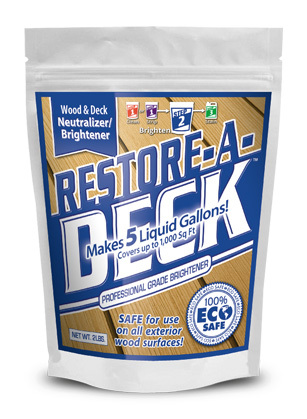 Note: Restore-A-Deck Wood Brightener is not formulated to remove intact paint, stain, or clear finishes. This brightener is not a cleaner. It will not remove grayed wood fibers. 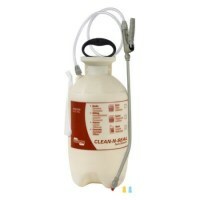 It is meant to serve as a wood brightener and pH balance after using a deck cleaner or stain stripper. Extremely cost-effective. When mixed, the cost is less than $6 a gallon. Coverage: 750-1000 sq.feet per container. Great product for neutralzing the RAD Stripper or RAD Deck Cleaner. Can be used to brighten all exterior wood. About 2 years ago I stained my deck with the Armstrong Clark Semi Solid stain. If I want to clean my deck after 2 years should I use the deck cleaner only or should I be using both the cleaner and brightener. I don't think I will be putting any stain on this year. The RAD prep products are only to be used if reapplying as it will remove some of the stain. You would only need to cleaner for the prep. You have to use the brightener after the stripper. It does come in a powder that makes 5 liquid gallons. There is not a combo kit for the stripper and the brightener. I was curious if this was necessary after the RAD stripper. Also, does it come in a powder form to extended it to 5 gallons like the injectable stripper? Lastly, I've seen cleaner and brightener bundles at a discount. is this also offered in a discounted bundle with RAD stripper?